Inbox by Gmail has always been a divisive email client, but unfortunately for its fans, Google announced it would end it in March 2019. 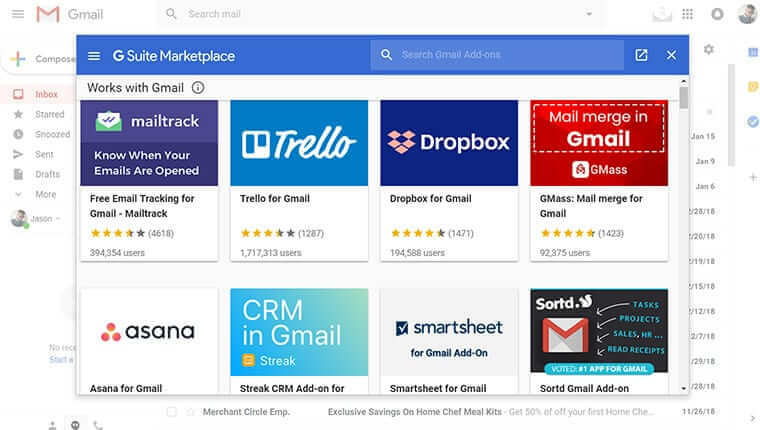 If you’ve fallen in love with some of its features, there’s no reason to despair since you can enjoy nearly everything that has made Inbox by Gmail so great with Clean Email and five other best alternatives to Google’s innovative email client. Announced in limited invitation-only basis on October 22, 2014, Inbox by Gmail was officially released to the public on May 28, 2015. Developed by the people behind Gmail, a free email service by Google that comes with 15 GB of free storage and allows users to receive emails up to 50 megabytes in size, Inbox by Gmail has only a few months of life left before it will reach the end of its service in March 2019. 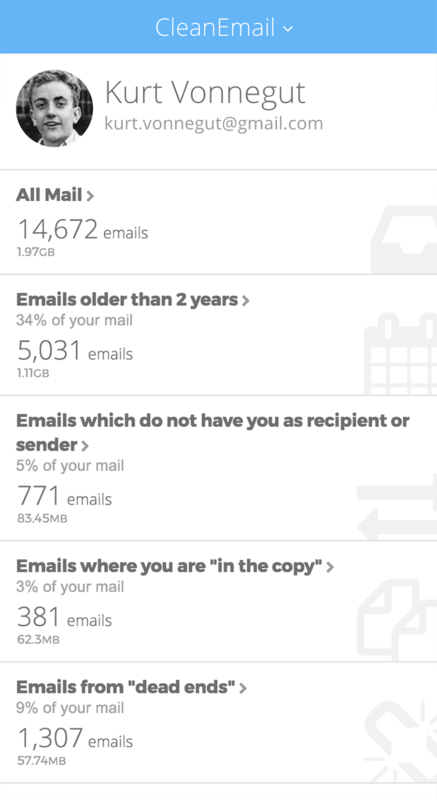 The team behind Inbox by Gmail understood just how big a problem email clutter is, and they have heaps of data to back it up. It takes a lot of time to tell legitimate emails apart from spam and cleverly disguised marketing newsletters. And even when you’re certain which emails demand your attention, there’s no guarantee that you’ll have enough time to respond to them as soon as they arrive. Inbox by Gmail solves this problem with features such as email snooze, automatic email bundles, reminders, highlights, and smart replies, just to name a few. While Inbox by Gmail reviews praise its innovative approach, the app has failed to convince die-hard Gmail users to make the switch and embrace Inbox by Gmail as a full-fledged Gmail alternative. Google was quick to take notice and decided to pull the plug on Inbox by Gmail in March 2019, incorporating some of its most popular features straight into Gmail. If you miss the simplicity and automation of Inbox by Gmail, you’re not the only one. Yes, you can still use this innovative email client for a few months, but you should really be looking for an alternative. To help you make the transition a bit more pleasant, we’ve selected top 5 best alternatives to Inbox by Gmail that won’t be shut down anytime soon. Gmail has gone through a radical redesign, and this incredibly popular free email service by Google now supports many features that were previously found only in Inbox by Gmail. Its new user interface is easy to use, supports customizable swipes and smart replies, and you can integrate Gmail with a whole host of third-party apps. Having a Gmail account gives you instant access to Google’s entire app ecosystem, including Google Docs, Photos, and YouTube. Microsoft’s free email service doesn’t have much in common with the clunky desktop email client most office workers have nightmares about. 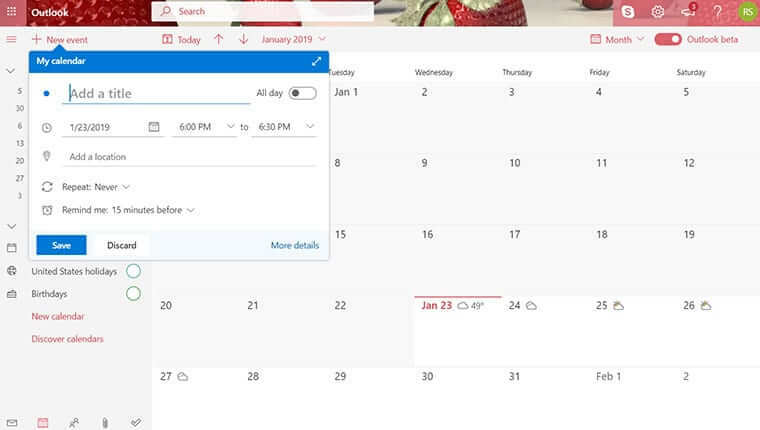 The company’s web-based email client is modern, easy to use, and it includes a calendar tool, a contact manager, and a task manager. You can navigate it with both your mouse and keyboard for increased productivity and enjoy seamless access to other Microsoft services, such as OneDrive and Skype. Unlike Inbox by Gmail, Spark works only on iOS and macOS devices. 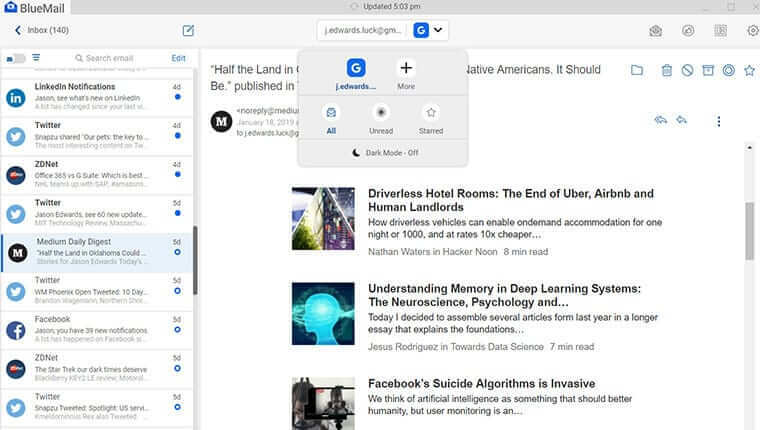 But if you’re a Mac user who’s been looking for an alternative to Inbox by Gmail, you’ve just found it. Spark features a smart unified inbox that collects all the emails from all of your accounts and automatically categorizes them for easy processing. When you see an important email that will likely lead to a long conversation, you can pin it to prevent it from becoming buried under a pile of new emails. You can also snooze unimportant emails for later with a simple gesture. Should you make a mistake and delete a wrong email, you can simply shake your smartphone to undo the action. Postbox is an elegant, clean, and powerful email client for Mac and Windows computers that organizes your emails for you so you don’t have to. 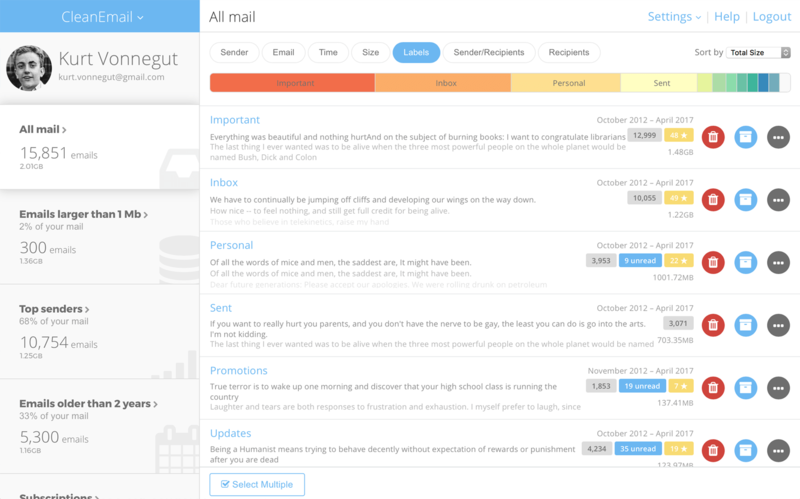 It features a simplified email view that isolates important messages from marketing spam. You can use tags to make email retrieval easier and mark certain contacts as VIPs to always see emails from them at the very top of your inbox. Postbox supports integrations with countless third-party productivity and communications apps, including Asana, Evernote, Slack, Trello, Mailchimp, Jive, Google Drive, Gmail, and many others. 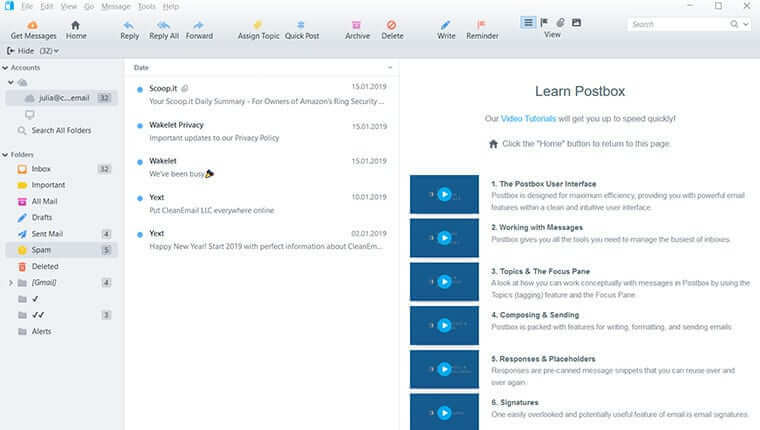 BlueMail is a multiplatform email client with integrated calendar functionality and support for an unlimited number of mail accounts from various providers. It sports a modern material design user interface that should feel very familiar to all Android users. Unlike many other email clients, BlueMail is people-centric, which means that it focuses on connections and conversations rather than individual emails. It can automatically tidy up your emails into easy-to-manage clusters and send you push notifications when important emails arrive. One of the most beloved features of Inbox by Gmail is its ability to separate important emails from everything else. 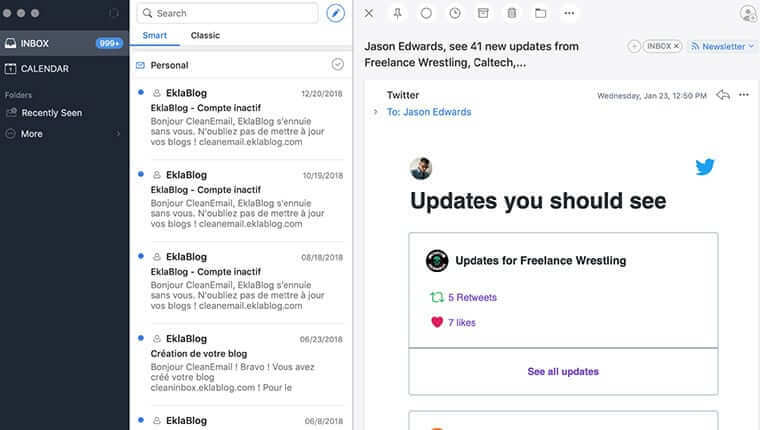 If this was the reason you fell in love with it, we have good news for you: Clean Email, a bulk email cleaner compatible with Gmail and all the other major email services, can help you organize your inbox even more effectively. Clean Email relies on highly accurate algorithms that can distinguish emails from your boss from emails send by marketers and spammers. It groups relevant emails into easy-to-review bundles, and you can then decide what you want to do with them. Is your inbox running out of space? Simply delete all subscription emails with a single click and enjoy a few GB of extra space. You can even automate email management thanks to Clean Email’s automation features to say goodbye to your email woes once and for all. Even though Inbox by Gmail won’t be with us for much longer, there’s no reason to be sad about its inevitable departure to the digital graveyard. There are many excellent Inbox by Gmail alternatives that can help you stay productive and prevent the daily influx of email from overwhelming you.